Embroiderers' Association of Canada, Inc.: CGNFA Hosting Fibre Potpourri! 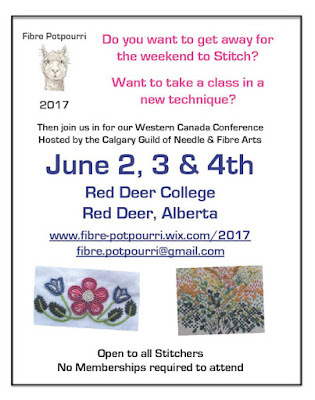 Here in Alberta we are getting ready to host our annual Fibre Potpourri June 2, 3 & 4th, a celebration of the potpourri of fibres we all stitch with. 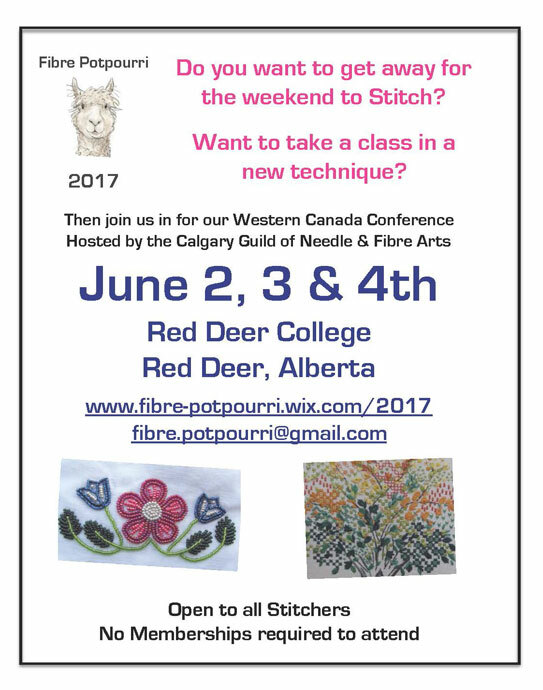 This year the Calgary Guild of Needle and Fibre Arts is hosting the event at the Red Deer College in central Alberta and everyone is welcome. Our event website is http://fibre-potpourri.wixsite.com/2017 and you can find out all about our classes we are offering and download our brochure. Registration closes in May so register soon to save your spot in our classes. We are also offering a retreat only option if you want to hang out with fellow stitchers, swap stories and work on your own stash of "Project Half Dones" or PhDs ... we will have four vendors during the event and a charity auction after our banquet Saturday night.